For Cowboys Only! And Those Who Want to Pretend! This is the largest Cowboy Festival in Canada, and one of the largest in North America. 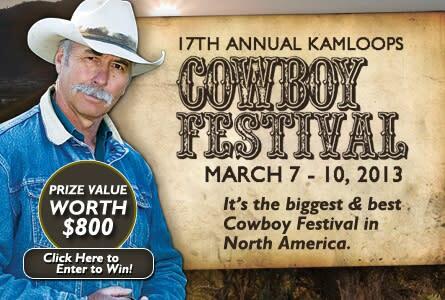 It is a celebration of western heritage in Kamloops and showcases the best in cowboy poetry and western music, as well as cowboy artists and artisans. Entertainment begins with jam sessions and a kick-off party Thursday night and goes almost non-stop all weekend. There are three stages offering Cowboy Poetry and Western Music each day from noon until evening. On Friday and Saturday nights, guests have a choice between main stage concerts at Calvary Community Church or our dinner theatre shows at Kamloops Convention Centre. Cowboy Church on Sunday morning is always very popular, followed by another day of great entertainment. The Cowboy Art and Gear Show features more than 30 artists and artisans, displaying a wide range of artwork and custom-made cowboy equipment. A series of seminars and workshops are offered over the weekend on varied topics such as ranch roping, poetry and songwriting, guitar picking styles, and learning to yodel the cowboy way. This is a fantastic opportunity to experience real talent and a great activity for the whole family, couples, and kids! Pack your blue jeans, hats and boots. Come see friendly smiles and have a toe-tapping, hand-clapping good time!